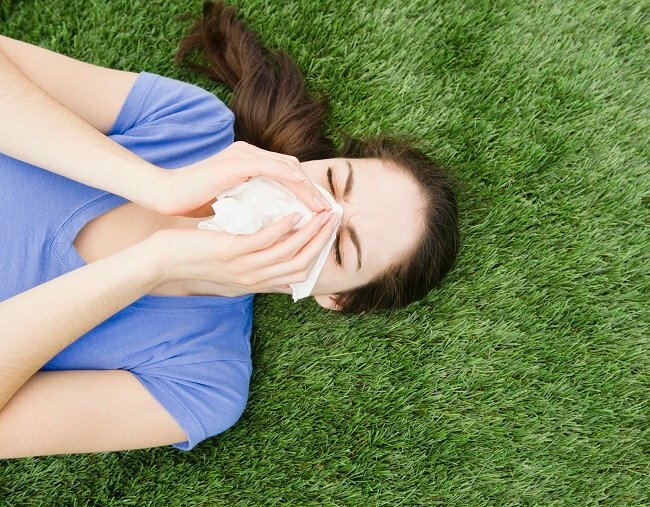 The reality of hayfever: here are five daily struggles we all face. Five daily struggles everyone who suffers from hayfever knows. It’s a couple of minutes past 9am and I’m briskly walking to my desk trying not to draw attention to the fact that I’ve walked into the office late. I sit in my chair, drop my handbag down next to me and turn my head when I’m met with the face of a co-worker. “Are you OK?” they ask me, leaning in close with a look of concern painted across their face. “Yes?” I respond to their question with a question. I mean, I think I’m OK. Am I OK? I ask myself. Hang on. Of course I’m OK before I start to panic at the thought of my skirt being tucked into undies or looking down and noticing I’m wearing two different shoes. “It’s just, it looks like you’ve been crying,” they respond and then it dawns on me. That God. Damn. Hayfever. That God. Damn. Hayfever. Image via Getty. If you suffer from it too, you&apos;ll know exactly what I&apos;m talking about. No, we&apos;re not crying, our eyes are just constantly on the brink of watering. But thank you, concerned fellow staff member, for noticing. 1. Your day is ruined if you forgot your hayfever tablets. The easiest way to find me is generally to follow the trail of my hayfever tablets. It&apos;s my safety net, my warm fluffy blanket, my hot cup of tea, the one that that will keep all of those dreaded symptoms in check. That&apos;s until I forget to pop that beautiful little box into my bag - and all of a sudden my day falls apart. Much like my ability to hold back all of the mucus that&apos;s currently collecting in my throat, nose and probably ears. 2. You&apos;re the only person who is definitely not excited about spring. Sorry little daisy. If only we could enjoy you. Image via Getty. 3. The sneezing is sometimes so unbearable, you wish you could pull your face off. Have you ever felt a sneeze coming on that&apos;s so severe, so intense, so earth-shattering, that it almost makes you want to pull your face off? Welcome to the life of every single hayfever sufferer ever. The sneezing is so next level that sometimes people will give you a side eye with a look on their face that says, &apos;I&apos;m just stunned your head didn&apos;t fall off after that one&apos;. There&apos;s only one thing that&apos;s worse than the avalanche of sneezes and that is sneezing in one particular place. The car. Because surely, that&apos;s how every one of us hayfever sufferers will end: Mid-sneeze on a highway. 4. It&apos;s a guessing game whether you have hayfever or the flu. Do I have hayfever or the flu? Well, it&apos;s anyone&apos;s guess really. Image via Getty. Sneezing. Check. Water eyes. Check. Blocked or runny nose. Check. Headache. Check. Do I have hayfever or the flu? Well, it&apos;s anyone&apos;s guess really. Sometimes you just have to roll the dice and pray it&apos;s whichever one is less severe of the two. It&apos;s like being in the worst lucky dip of all time. 5. Itching your eyes only makes them feel itchier. It&apos;s so counterproductive, but oh so addictive. You know it won&apos;t make you feel better, in fact, scratching is a guaranteed one-way ticket to making you feel worse. And it&apos;s quite possibly one of the worst things about hayfever. Honestly imagine if exercise made us more unfit and eating only made us more hungry. The level of ridiculous is simply unparalleled. But hey, down the frown because it&apos;s not all doom and gloom. There&apos;s one part of the day that is absolutely amazing. When you&apos;re all tucked up in bed with clean sheets and a cuppa, ready to sleep like a baby... and hopefully not wake up with an &apos;a-choo&apos;. Are you are hayfever sufferer? What is one of the daily struggles that you face? This content was created with thanks to our brand partner Dyson.